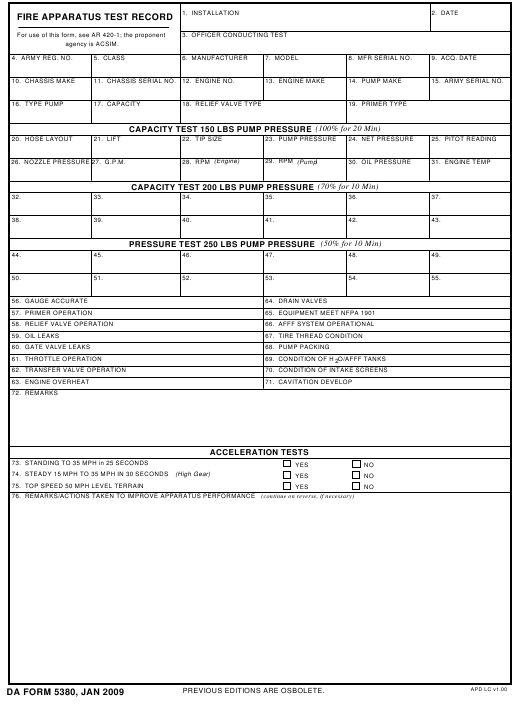 DA Form 5380 - also known as the "Fire Apparatus Test Record" - is a United States Military form issued by the Department of the Army. The form - often mistakenly referred to as the DD form 5380 - was last revised on January 1, 2009. Download an up-to-date fillable PDF version of the DA 5380 down below or look it up on the Army Publishing Directorate website. 11. CHASSIS SERIAL NO. 12. ENGINE NO. 26. NOZZLE PRESSURE 27. G.P.M.